July 2005, Volume 2 Issue 7 Know It - Profit! "More Growth Ahead For Biotechnology Sector?" This month we take a look at the Biotechnology sector where recent gains have kept this index solidly in the black. But first... how have the broad markets been holding-up? All the indices except one are still to the plus side. The Russell 2000 is up over 5 percent for the period while the Nasdaq Composite and S&P 500 remain in positive territory. The Dow Jones Industrials took a beating at the expense of higher oil prices. The manufacturers finally are feeling some pressure as the market factors in the higher cost of producing goods and services. There are a handful of sectors making impressive gains this month. The AMEX Morgan Stanley Healthcare Payor, AMEX Securities Broker/Dealer and S&P Insurance indices are all in strong up trends. 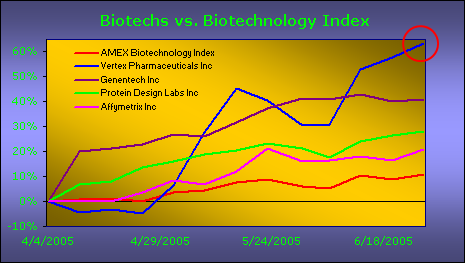 The AMEX Biotechnology Index is especially strong... staying positive during the entire period. 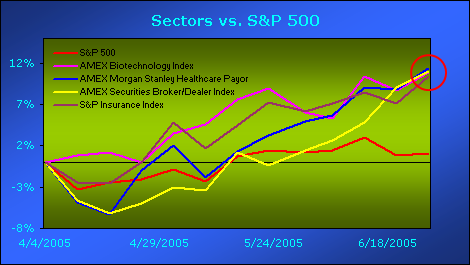 Strong leaders in the Biotechnology index will keep this sector moving higher in the coming months. Stocks like Genentech Inc and Protein Design Labs Inc are making steady progress... up 41-27 percent, respectively. Affymetrix Inc is doing well. In a consolidating market, it is up over 20 percent. 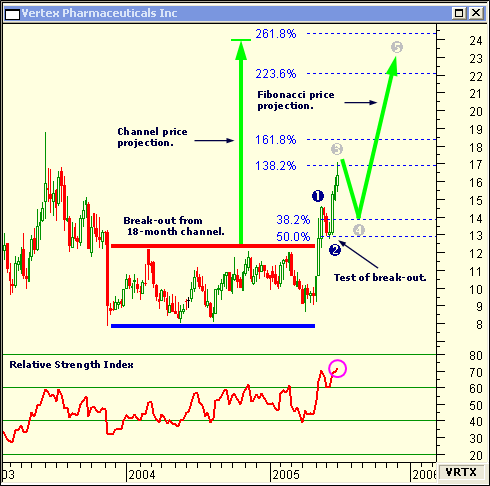 Vertex Pharmaceuticals Inc (VRTX) exploded out of a 18-month trading range and is up a stellar 63 percent over the last quarter. VRTX appears to be in the target zone for completing an Elliott third wave. Once Wave 3 is confirmed, expect a 38-50 percent Fibonacci retracement pull-back for Wave 4. Then, another strong move should carry the stock higher to the 223-216 percent price Fibonacci extension zone... completing Wave 5. 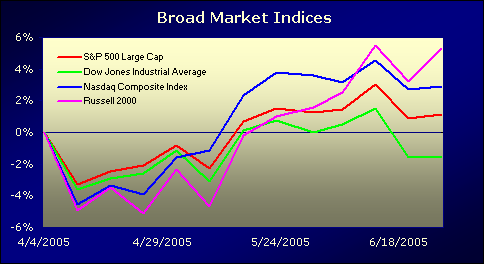 The Relative Strength Index (RSI) confirms the over-all strength of the stock. Until a price/RSI divergence forms, expect the current trend to continue. You can also use the length of the channel to forecast a final price target by taking the channel length and projecting it from the price break-out. Note how the channel price projection coincides with the Fibonacci extension price target. When multiple methods line up, you can take the results to the bank! In the May 2005 issue of Chart Wealth, the Utilties HOLDRs Trust (UTH) (View Chart) was due for a major correction. A correction did occur... but, it was not a major correction! What was labled as the possible end of the Wave V, in retrospect, should have been the end of Wave III! UTH pulled-back to a low of $100.5 (end of Wave IV) during the week of 5/13/2005 before continuing higher. Now... if a minor Wave V Fibonacci price extension of 223-261 percent is applied to Wave I, we can forecast a price target of $127-$136! Not all of your trades are going to end up the way you forecasted them to be. Therefore, it is crucial you use protective stops to control your down-side risk. However, if you use multiple non-corrollating indicators and sound money management techniques, you'll be able to bank consistent profits.